Sydney, 22 January, 2015: Australian taxi app and mobile payment provider, ingogo, today announced a new Chief Commercial Officer (CCO) Craig Hopper, and new Chief Financial Officer (CFO) Trent Jerome. The new staff appointments come as ingogo eyes nation-wide expansion and is set to launch new products in the year ahead. Founder of ingogo, Hamish Petrie, said both Mr Hopper and Mr Jerome are great assets to the team, particularly with their experience relating to ingogo’s plans to expand in other cities and launch payments technology for small businesses. “With strong teams in Sydney and Melbourne, where ingogo is live, we are now starting to grow ingogo in new cities with Adelaide, Brisbane and Perth on our hit list,” he said. “Mr Hopper brings a wealth of experience and knowledge to ingogo as its new CCO, especially to assist and help lead this expansion. Craig Hopper, CCO, is an experienced General Manager, COO, Marketing and Sales Leader, with 20 years’ experience in financial services, telecommunications and management consultancies. Hopper spent the last 10 years with GE Capital in Australia and in Europe in senior roles in General Management, Sales, Marketing and Operations. Prior to that he worked for SingTel Optus for three years in Product and Strategic Marketing and five years at Accenture in London as a management consultant. With a growing sales team around the country, Hopper’s role as Chief Commercial Officer involves leading the Sales, Business Development, and Corporate Development efforts. Trent Jerome, now ingogo CFO, has more than 22 years of progressive experience in finance and operations, with roles held previously at AAPT, PowerTel and Salmat. At ingogo, his core responsibilities will include heading up the finance department, preparing ingogo for IPO, company secretarial, operational plan development and development of business strategy and investment. Mr Jerome said: “I thoroughly enjoy working in companies that improve an industry and challenge an incumbent. I have been following ingogo's success since its start-up and I am very excited to be taking ingogo to its next level." In October 2014, ingogo announced a $9 million funding round, taking its total raised to $16.2 million. It also announced a partnership with Xero to develop a portable payment and accounting platform for small businesses. ABC Innovation today announced the appointment of Alvaro Marquez to the newly created position of Head of Service Design, ahead of its evolution into ABC Digital Network in February 2015. Marquez has over 14 years’ comprehensive expertise in product development, user experience, visual design, ideation and art direction that has seen him lead work for brands including Audi, BMW, Nokia, GSMA, Microsoft and the Commonwealth Bank of Australia. Prior to joining ABC Innovation, Marquez was Creative Director at global design firm frog in Shanghai where he developed a scalable design vocabulary and unified design language system for one of the largest financial entities in Asia. He also led a team of designers, technologists and strategists in developing concepts around new ground-breaking mobile and image sensing technologies for historically relevant mobile developers. Throughout his professional career, Marquez has managed large Experience Design projects for leading organisations, gaining experience in Shanghai, Amsterdam, New York, Singapore and Madrid. Marquez’s role as Head of Service Design was created as part of the leadership restructure at ABC Innovation as it evolves into ABC Digital Network. Marquez will be tasked with driving an integrated audience-centric focus and bringing together User Experience (UX) and Design into one aligned team. Director of ABC Innovation, Angela Clark, said: “We are delighted that Alvaro is joining the ABC Innovation team. More than ever, it is now critical that our online product offerings are audience-centric, and that we focus on the needs of Australians in a rapidly changing media landscape. ABC Innovation manages the ABC website abc.net.au and core mobile offerings including the ABC iPhone, iPad and Android apps. ABC Innovation also creates digital media content and services for online, mobile and emerging platforms. ABC Innovation will be known as ABC Digital Network as of February 2015. Communication services leader, Blue Star Group, has pioneered an Australian-first for the property market, with the nation’s most advanced bespoke augmented reality (AR) marketing campaign bringing home buying into the 21st century. The initiative, tagged to Caxton Property Group’s upcoming Chapman Green development based in the affluent Beecroft area in Sydney’s north, is the first roll out in the property sector for leading AR provider Blue Star Interactive, which launched in February 2014. 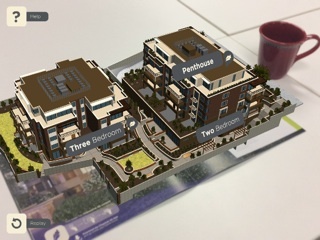 The project’s three separate AR experiences have been developed to give potential purchasers the opportunity to immerse themselves into the property in a virtual context prior to the structure’s completion. Channelled through a Chapman 4D app, available for public download on iTunes and Google Play, the AR experience is accessed simply by pointing a smartphone or tablet at any Chapman Green 4D-activated image – which in this case includes onsite signage and a billboard at nearby Epping train station, along with brochures, press advertisements and other marketing collateral surrounding the project. The user is then submerged in a 4D augmented and virtual world where select apartments can be interactively viewed with additional life-like sound effects engaging the viewer’s senses. The viewer can select from a range of typical apartments and be transported to their unit of choice to access authentic real-world balcony views from various property aspects. At the construction site, the property rises-up from the ground to appear at its real world size, in-situ. Blue Star Interactive head, David Francis, commented that: “Our communications future is all about 4D, with AR being the first generation of immersive technology. As the only Australian company that offers an end-to-end augmented reality production solution, Blue Star Group is excited to be pioneering this technology in the property space. Aside from the transformational nature of how users interact with the marketing materials, AR will also provide valuable insights into users’ behavioural data. This includes information such as which apartments are being looked at, how long they looked at it for and the user’s geolocation. These metrics build essential records to aid in marketing efforts as new consumer areas of activity are defined. Blue Star Group believe that stepping into AR technology offers a competitive edge into the promotion of future developments as it amplifies investor reach across global territories with a mobile virtual sales centre accessible from any location. Blue Star Interactive has also built a proprietary iTunes and Google Play application called STELLAR that affordably allows any brand, of any size, to start to their 4D journey. Blue Star Interactive recommends the use of iPad Air for the best possible viewing experience. Blue Star Group services all major industry sectors in Australia including financial services, publishing, retail, communications, property, clubs and associations, not-for-profit, utilities, manufacturing, education and government.